Here is the new addition to the fold I wrote about recently. 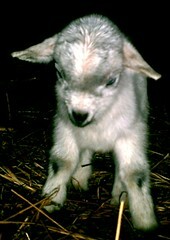 I’ve decided to call her GiGi. 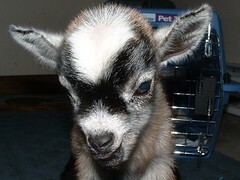 I’ve been referring to her at home as Goaty Girl because I didn’t have a name yet, so I just shortened it to GiGi. 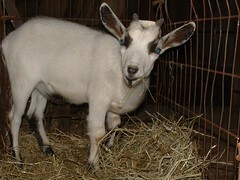 Mr. Bird has gone and brought home another pygmy goat from the livestock auction where he works. He said he really liked her looks and wished he could have bought one of her brothers too to breed our other pygmys this winter. We have to wait until November or December otherwise the kids will be born in the dead of winter which has been our downfall too many times already. I looked at him and asked if he was trying to break my heart again. 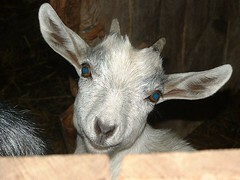 I looked at her (very sweet face) and told her she had better not break my heart again! We have quarantined her and will be vaccinating and worming her and keeping an eye on her before we let her in with the others. My children were outside in the barn with her this morning giving her exercise time out of the crate and making sure she had clean water and hay. They tell me she was chasing them and climbing the hay. I lost My Little Bella today. She got very sick very quickly and the vet tried to help but couldn’t. 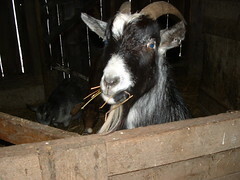 Pita is our only male goat at the moment. He’s pretty much the herd protector since he’s bigger than the girls. He really can be a pain in the, well, you know. He’s always the first in line for animal crackers and if you don’t give them to him quick enough he’ll start eating your shirt instead. This is Kizzy. She is 5 months old today. She’s a real love. She gets jealous when I give Bella some of the attention too.